Our world often shakes from shocks: wars, epidemics, bloody religious clashes - and the further in its development humanity walks, the more shocks the world experiences. So it is necessary, so important, so valuable behind all this not to forget yourself, to remain faithful to the one who gave you this life. “Stop for a moment, close your eyes, inhale and exhale and just lift your eyes to the sky and let the beauty and tranquility fill your heart” - this is what Elena Belyaeva’s paintings, united in one exhibition structure called “Melodies of Buddhism”, tell us about it. The devastation generated by the modern life of the metropolis, recedes, with only one look at the picture "Infinity". You look at it and the pettiness of everyday turmoil becomes absurd, you feel the invisible presence of the creator in every subject, even in the little things that you used to ignore. Participation in the general flow of time, the feeling of being part of a huge universe, makes you relax and surrender to the flow of life, its chaos, in which everyone is in fact in its place and has its own purpose. This picture, perhaps, can be considered the key uniting in itself all the melodies of Buddhism together, organizing them into a harmonious composition of blissful iridescence of music. The exhibition composition consists of 30 paintings, united by a common theme, one mood, one style. Stunning work of the artist Elena Belyaeva will soon be able to see everyone. A series of paintings "Melodies of Buddhism" - a unique phenomenon of modern art, so sincere, so bright, they are designed to change the world within each of us. Belyaeva Elena graduated from the Far Eastern Pedagogical University in 2000. In 2011, the personal exhibition "Seasons". Since 2016 he has been engaged in the studio Gudkov A.S. Since 2016. Member of the TSHR. 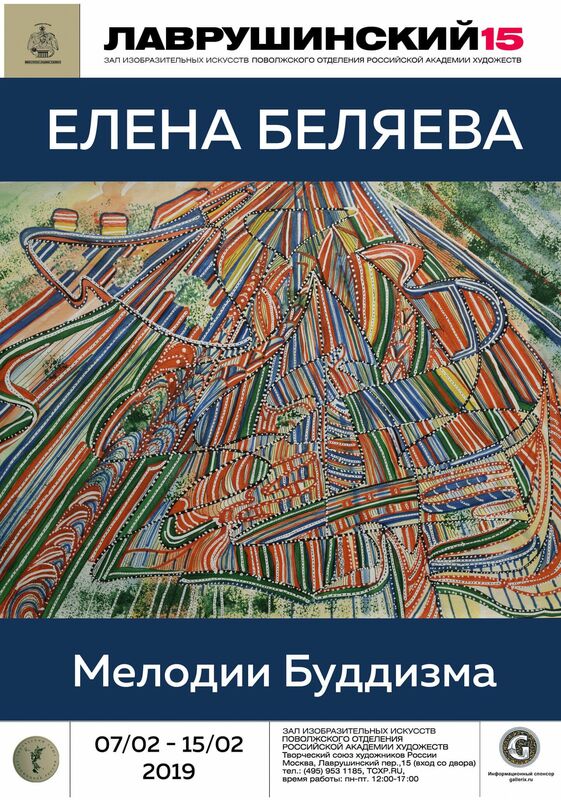 Recommendation for the series of works by Elena Belyaeva "Buddhist Melodies"
The works of Elena Belyaeva from the cycle “Melodies of Buddhism” interested me with their imagery and non-trivial abstraction. She was able to portray objectless things vividly, richly, to convey their multifaceted essence through the means of composition and original flavor. This can be clearly seen in the works "Infinity" and "Jump." They convey the main essence of the phenomena and at first glance they recognize images expressed in seemingly simple lines by rhythms and colors. Master transmission rhythm can be observed in the work "Jump". At first glance it seems that the colors and lines are chaotic, but it is not. Having detained an inquisitive look at the picture, we see clear color alternations. It should also be noted, and the overall composition, built on the opposition of straight strict lines, seeking upwards and, as if in contrast, soft rounded lines around. Through this work, one can feel the powerful effort and energy of the jump, his impetuous vector and this feeling arise precisely because of the fact that the artist used in her work the opposition of sharp and soft bends of lines. I would also like to mention the work "Drops on the water." This picture differs from the previous one in that it depicts not a non-objective, but a concrete phenomenon, however, the artist did not change his style and approached this work with a special feeling. The author did not simply and realistically copy nature, but was able to convey the image in his intuitive manner. In this work there is also a game of rhythms, but I would like to mention the colors and shades that were used. Red and yellow, ocher, and green and blue were used to depict water, most of which were muted, and the author did not use open colors. Due to this, the reflective property of water was transferred, which helped to very accurately get into the desired image. The materials with which the artist wrote her works in the “Melodies of Buddhism” series intrigue no less than the images of these paintings. Elena Belyaeva used not only artistic paints and all sorts of liners, but also seemingly things not even related to artistic materials, such as felt-tip pens and putty The original approach to the materials and their combination allows us to reveal a creative individuality and once again prove that the artist can work not only with professional, but also with simpler tools while creating to create awesome, bright and imaginative works.